Keeping up with two kids schooling has kept me busy for the past 3 years not to mention the little ones, especially the newest little one, she is BUSY! Now this year we are adding number 3 to our little Moore Jedi Academy, yeah that is seriously what my husband calls our school. Anyhow, between the toddler and new student, I have a feeling more organization will be required on my end to keep up with it all. Because of this, I am starting to organize our curriculum for next year; I typically procrastinate until August and run out of time! This post does contain affiliate links that cost you nothing, but purchasing through them helps us pay for even more books! I hesitate to call it kindergarten since he will just be five, and we will move at his own pace even if it takes more then a year. His older sister, who also has a summer birthday, didn't really start kindergarten work until the winter after she was five, so we will just try it and see. Five in a Row - I used Five in a Row with the girls as well as a base curriculum. I love that it is book based and covers so many topics in an easy to follow format. 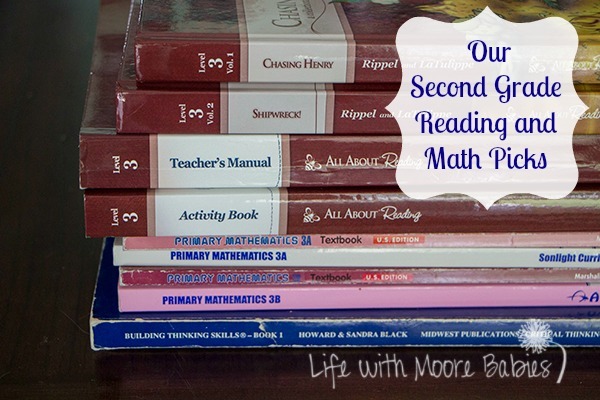 It does recommend additional reading and math curricula to go alongside it. 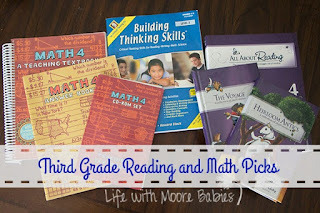 Rocket Phonics - My pick for a reading curriculum at this age is Rocket Phonics. It is game based and they can start reading words with the first lesson! Very empowering for a beginning reader, and the game based design works well for active kids! 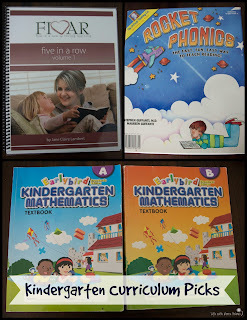 Singapore Math Kindergarten - For math, we will go through Singapore Earlybird Mathematics. I waited to introduce this to my girls until they were considered kindergarten, but at that point, they found it too simple. In fact, we ended up covering the entire year in a few months. It should be a good introduction for a little guy who hasn't had much formal learning. Yes, some days, mommy guilt gets me feeling like he has been a bit neglected, and then I remember all he has learned from being around the older kids and just through play! Now for the girls, it is hard to believe they are already going to be second and third graders! Since they are so close in age, 15 months apart, I have always tried to do as much of their schooling together as possible! I can't imagine having completely separate curricula for 3 kids, I really don't think we would get through it. But by keeping most subjects together, we manage to get through. Reading, math, and critical thinking are the three subjects they do apart from each other. All About Reading 3 - We started a few years ago with level 1, and they still love it! Many lessons have little activities, but they are not like your typical worksheet. They can color if you want, but most involve cutting and actively using the pieces to practice reading. Singapore Math 3 - Singapore math has given the girls a good base in math which is why we continue to use it. Plus, they enjoy having their own workbook. I don't really understand the thrill of it, and I suppose other math curricula have a similar set up, but no need to change when it's working! Building Thinking Skills Level 1 - Critical thinking is so important especially when it seems some people are not as inclined to logic as others. So this past year we started using these Building Thinking Skills books to help our kids start thinking more logically. This quickly became one of their favorite subjects! All About Reading 4 - Again, we love All About Reading! 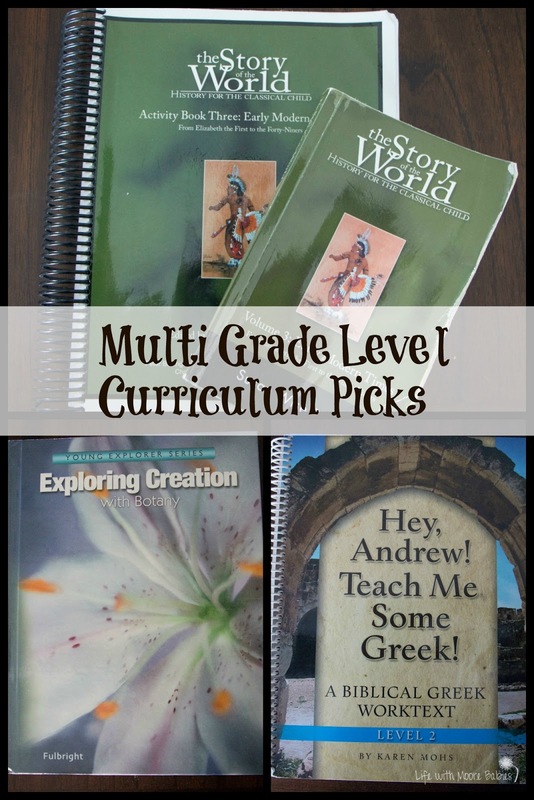 Unfortunately, 4 is the last level, so next year I will be on the curriculum hunt again! 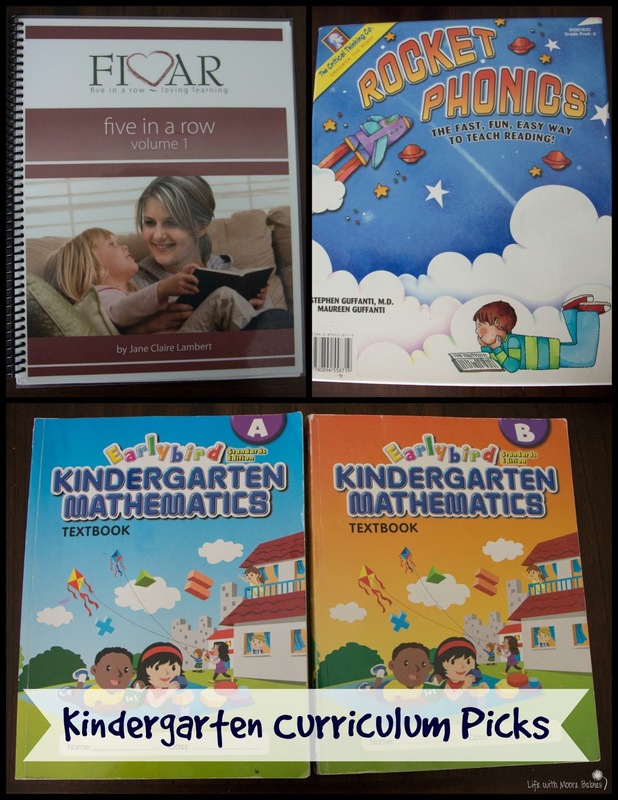 Teaching Textbooks 4 - That's right, we are not continuing with Singapore math here. I fully planned to, I even purchased the first half of the year, and then my husband had his say. He has no problem with Singapore math, but he had a problem with the amount of time I was spending teaching both of the girls, knowing I was adding more next year. My oldest is a natural at math, she picks it up quickly with little explanation (sometimes no explanation), so we decided to get a program that would allow her to work more independently. Plus Teaching Textbooks is on the computer, so computer skills. The self-grading is a going to be a great time saver too! Building Thinking Skills Level 2 - Critical thinking again! My oldest blew threw level 1 in a year, so hopefully level 2 will be more challenging for her! Then we have all the subjects we can do together which is such a time saver. 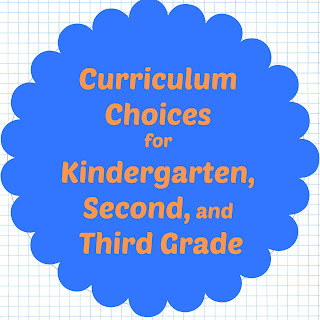 These include most of our language arts, science, history, and foreign language. Writing Strands 2 and Writing Strands 3 - I list both of these because we started level 2 this past spring, so we haven't finished it. Not finishing a book is hard for a perfectionist like myself, but in this case, I had to give in or we would be writing every day all summer! Hopefully, we finish level 2 in the fall and move on to level 3. Level 3 is designed to take multiple years so I can relax my OCD tendencies. All About Spelling 3 - Just like All About Reading, my kids love the hands-on approach to spelling. They are not gifted spellers, but the phonetic approach plus active moving of tiles helps! 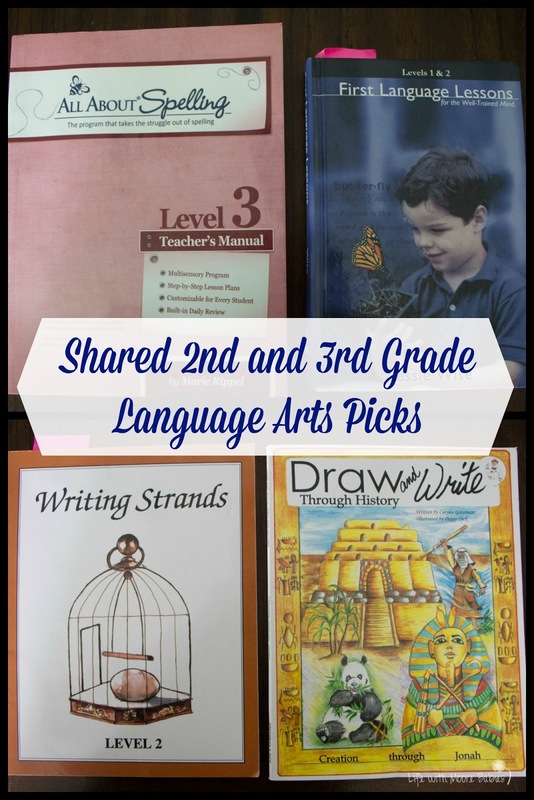 First Language Lessons Level 2 - We started grammar last year for the first time using First Language Lessons 1, and my kids enjoyed the short lessons; they even enjoyed the poetry memorization! Draw and Write Through History - Handwriting, I am still assigning them handwriting. We started with cursive, and we haven't looked back. These books have them copy a passage of history in cursive and then give instructions to draw a corresponding picture. It is good history review plus cursive practice. Apologia Botany - This will be the third Apologia elementary science book we have used; we started with Astronomy and then did Flying Creatures. No, we aren't doing them in order and luckily you don't have to. It is much easier to get my kids on board with a subject when I can show them options and let them choose! This year, they chose to study plants! Towards the end of last year, my little guy was getting more involved in their science too, so I bet he will jump in on this too. Since the books are all for K-6, he can do that with no problem. Story of the World Volume 3 - Volume 3 of 4 for Story of the World history this year. This curriculum is a life saver to me because I hate studying history, and I don't have to read it to these! We use the CD's, so they can listen to them anywhere before narrating or doing and activity. Once we complete the volumes, we will repeat them with the older kids going more in depth. Hey, Andrew Teach Me Some Greek Level 2 - Foreign language, it's daunting, especially when I don't speak one fluently. We started with Hey Andrew, Teach Me Some Greek last year, and so far, it is totally manageable. Last year was learning the alphabet and the letter sounds, and I was able to keep up although I think they know it much better then I do! All these books mean we will use lots of book marks too! We were using post-its (you may have noticed a couple in the language arts books above) to keep our place in our school books, but I think these Origami Bookmarks would be a fun project for the beginning of school, and we could use them to hold our place instead! Now that I have my curriculum in place, it is on to the planning phase! Really this is one time I could truly use the force!